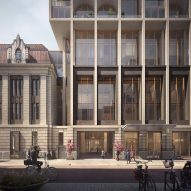 ODA has revealed visuals of Post, an adaptive reuse scheme that will revive Rotterdam's former post office, and include the construction of a 150-metre-high tower. Located centrally in the Coolsingel district, the post office is one of the only structures to survive the Rotterdam Blitz in 1940, making it one of the port city's most significant historical landmarks. 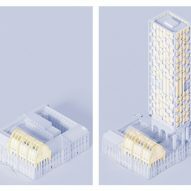 New York-based ODA will transform the 58,000-square-metre building, which has been vacant for over a decade, into a mixed-use complex, working in collaboration with Dutch practice Braaksma & Roos Architectenbureau. "We believe that it's time for the Post to stand not only as a memory, but also as an expression of the strength of Rotterdam today as a vibrant, connected, centre of culture, renewal, and quality of life," said Eran Chen, executive director at ODA. ODA aims to maintain and enhance the post office's original construction that dates back to 1916, and includes the 22.5-metre-high vaulted Great Hall. The space will become the "public heart" of the residential, retail, and hospitality complex, which will be developed by Omnam Investment Group. 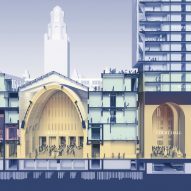 It will be accessed by two existing street-level entrances and be lined with shops, galleries, restaurants and cafes, which spill out into the courtyard. 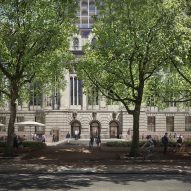 A 43 storey tower will be built within an internal courtyard within the former post office building. It will be elevated above the existing courtyard on a vaulted plinth, which will ensure the space is still useable. 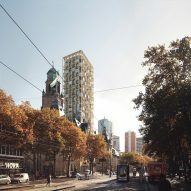 The tower will comprise a hotel, which will be connected to upper floors surrounding the Great Hall, alongside private residences. It will be characterised by columns with spacing that mirrors the facade of the existing building. "The Post tower is a reinterpretation of both urban living and the post office's architectural assets," continued Chen. "This modern addition is based on an extremely rigorous investigation combined with the expertise gained over two years working with city partners." 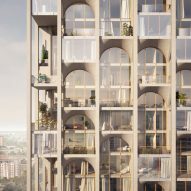 Its facade will also have a variety of different sized windows and openings, designed to funnel daylight into the tower while differentiating it from "the series of glass-facade towers along the new Rotterdam skyline". To maximise its connectivity on the surrounding streets, landscaping of the project will be completed by West 8, the lead landscape architect working on the redevelopment of Coolsingel. 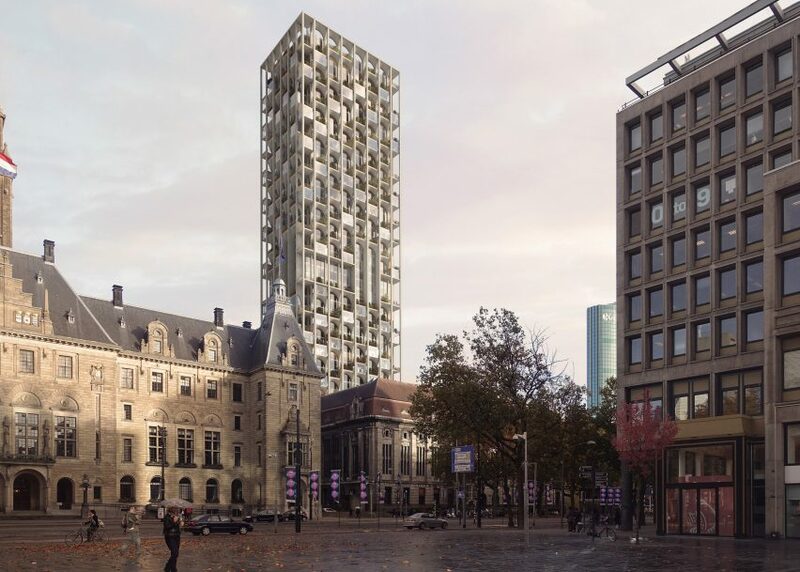 Post is the latest in a series of new structures unveiled for Rotterdam, as it continues to establish itself as a hub for new building technologies. Other recent proposals for the city include OMA's 63,000-seat stadium for football club Feyenoord Rotterdam, and MAD's "theatrical" viewing platform for a historic warehouse on the waterfront. Visuals are by Forbe Massie.